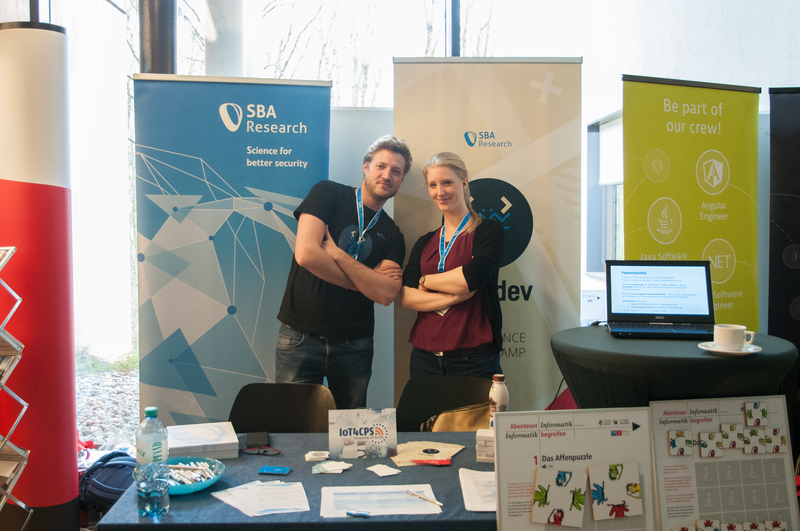 Alexandra Mai, Stephanie Jakoubi and Nicolas Petri had a good time at the Security Forum 2019, representing SBA Research. The Security Forum took place from April 11-12, 2019 at the Fachhochschule Oberösterreich, Campus Hagenberg. 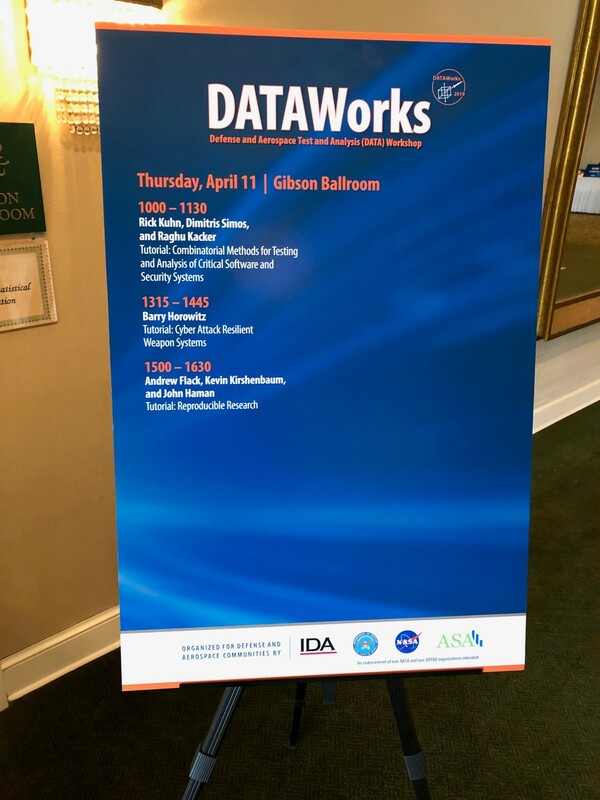 Dimitris Simos (SBA Research, MaTRIS research group) and Rick Kuhn (NIST, Computer Security Division) were invited to jointly present a tutorial on combinatorial security testing at the Defense and Aerospace Test and Analysis workshop (DataWorks 2019) on April 11th, 2019. The event takes place at Springfield, VA, USA and is organized by NASA, Institute for Defense Analyses (IDA) and the Office of the Secretary of Defense. Abstract: Combinatorial methods have attracted attention as a means of providing strong assurance at reduced cost, but when are these methods practical and cost-effective? This tutorial includes two sections on the basis and application of combinatorial test methods: The first section explains the background, process, and tools available for combinatorial testing, with illustrations from industry experience with the method. The focus is on practical applications, including an industrial example of testing to meet FAA-required standards for life-critical software for commercial aviation. Other example applications include modeling and simulation, mobile devices, network configuration, and testing for a NASA spacecraft. The discussion will also include examples of measured resource and cost reduction in case studies from a variety of application domains. The second part explains combinatorial testing-based techniques for effective security testing of software components and large-scale software systems. It will develop quality assurance and effective re-verification for security testing of web applications and testing of operating systems. It will further address how combinatorial testing can be applied to ensure proper error-handling of network security protocols and provide the theoretical guarantees for detecting Trojans injected in cryptographic hardware. Procedures and techniques, as well as workarounds will be presented and captured as guidelines for a broader audience. The tutorial can be download from here. Adrian Dabrowski holds a “myth busters session” on hacking, tracking of IP addresses, secure data transfer and numerous other hot topics at the 10th IT Businesstalk in Salzburg on April 11, 2019. A new study conducted by WU researchers that has been published in March 2019 provides novel insights how shootings and terror attacks affect the emotions and the corresponding communication behavior of social media users. For the study, five shootings and terror events have been analyzed that happened in three different countries (France, Germany, USA). Senior researcher Johanna Ullrich has been interviewed by Austrian Broadcasting (ORF). In the TV show Eco, she explained potential security and privacy pitfalls of smart meters that are mandated by EU legislation. The show can be watched in ORF’s TVthek within the next 7 days. Bernhard Garn and Dimitris Simos visit the National Institute of Standards and Technology (NIST) [NIST] during April 4-8, 2019. The purpose of the visit is to jointly host with NIST researchers (Raghu Kacker, Rick Kuhn) the 3rd SBA/NIST workshop on combinatorial security testing [CST], and to discuss recent research activities of the MaTRIS group of SBA Research [MaTRIS] and the ACTS project team of NIST [ACTS]. The workshop also includes the annual progress meeting of the NIST funded SENTINEL [SENTINEL] project co-led by the MaTRIS group (Dimitris Simos) and University of Texas at Arlington (Jeff Lei), where there is a strong focus on combinatorial methods for testing of IoT systems. The visit has further as it purpose to facilitate research actions between the MaTRIS group and different divisions at NIST on emerging topics of cryptographic combinatorial testing and artificial intelligence testing. The research efforts of SBA and NIST researchers are expected to further strengthen the pivotal role of combinatorial methods in the field of security testing. Johanna Ullrich has been interviewed by demographieberatung.at on diversity in the field of information technology.